The new Lord Mayor of Leeds, Councillor James McKenna, spent a morning touring GSAL. Councillor McKenna was paying his first official visit to the school since taking up office in June. He was accompanied by his wife, Councillor Andrea McKenna, who made civic history in Leeds by becoming the first serving Councillor to hold the office of Lady Mayoress. Following refreshments with Principal Mike Gibbons and Governors, Peter Sparling, Liz Bailey and Professor Christine Leigh, he was taken on a tour of Senior School by head boy and girl Hugo Govett and Felicity Jordan. This included stopping off at an English lesson and a trip to the school library. 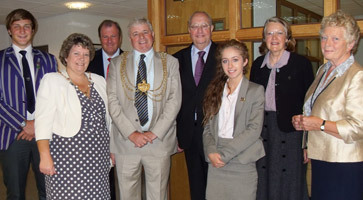 Pictured (L-R) Hugo Govett, Councillor Andrea McKenna, the Lady Mayoress, Mike Gibbons, Councillor James McKenna, the Lord Mayor, Peter Sparling, Felicity Jordan, Professor Christine Leigh and Liz Bailey.